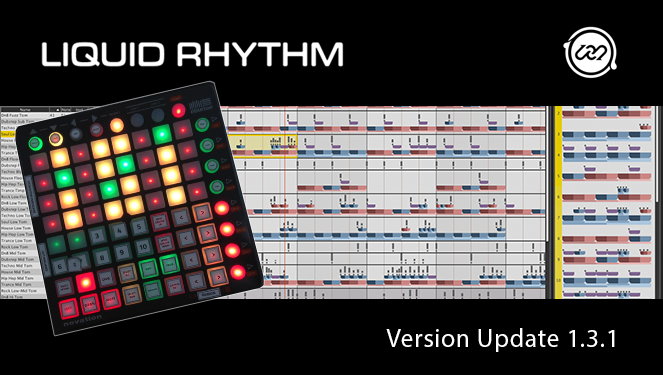 Liquid Rhythm and Liquid Rhythm Intro Updated to Version 1.3.1! More details of all the updates in version 1.3.1 are listed in the release notes below. Enjoy these and other fun and exciting updates to Liquid Rhythm and Liquid Rhythm Intro. The list below summarizes the new features, bug fixes, and workflow improvements included in the latest version. Duplicate Loop Region has been added to the right-click of the loop region bar. Revamped the Export MIDI to have its own wizards. MIDI files can now be exported as individual tracks. Added the ability to quickly delete notes that are muted. Right-click option on region selection within Note Edit mode. The contents of the BeatForm Sequencer can now be automatically loaded by selecting BeatForm Palettes in the Molecule Tools bar. BeatForms can be dragged out of the Palette and dropped anywhere on the arranger. Touchscreen-friendly features: Thicker scrollbars and floating window with buttons for commonly-used commands (available in the Options menu). Right-Click on BeatForm Tumbler Dial gives you a list of BeatForms to immediately change the dial to. Mute and Delete for notes based on their underlying colours. Silent General MIDI Percussion Kit has been added for users who want to exclusively trigger MIDI on an external device (without hearing any sound from Liquid Rhythm’s audio engine). ‘Region Focus follows Playhead’ mode added to Options menu. Useful when using a MIDI Controller to edit the region that is currently being played. New MIDI mapping feature in Accent Modifier Panel allows MIDI Mapping dials to control the range size of the velocity and groove sliders. The Beat Weaver will now always open with the BarForm wheel. Randomizer sliders now display the names of their functions on in the Molecule Tools. A sample’s instrument type can now be changed to any other instrument type. Liquid Rhythm would sometimes fail after downloading a new kit from online. BeatForm Tumbler would sometimes not clear a location when dialed to the initial position. Notes could sometimes fail to highlight when hovering over the Velocity shapers in the Accent Modifier Panel in Molecule Tools. Removed the ‘Track Add’ in Liquid Rhythm Clip mode because you cannot create new lanes in clip mode. Deleting a Beatform Palette would make the new selection appear empty. This has been fixed. Mouse Wheel Scroll on the Molecule Tools would be interrupted if there was another panel or feature that consumed mouse wheel actions. They have been changed to consume alt/option-mouse-wheel instead. Allows seemless scrolling in the molecule tool panels. Fixed bug where changing the selected BeatForm will cause an error when BeatForm Tumblers are in use. Tumblers would sometimes get out of sync with the focus region and the dials would change unexpectedly to the wrong BeatForm. Arrows for MIDI Mapping or MIDI Scripting would not work if there wasn’t already a region hilighted in the arranger. Now they automatically jump into selecting either the first region or last region. Windows Launcher for Liquid Rhythm in MaxLive patch fixed, where the patch would load fine, but the UI wouldn’t appear. DLL includes all required dependancies, so no need to install Microsoft Redistributable. Fixed a Liquid Rhythm crash in MaxLive Mode where choosing a loop from Liquid Rhythm library would cause a crash. Switching from BeatWeaver to BeatBuilder after selecting a row from the Molecule table would cause a crash. BeatForm Tumbler in “Position” mode would get disabled when focussed on an empty region. Instead, it’s enabled and uses the all-blue BarForm as default. Fixed a bug that would prevent Liquid Rhythm from preserving MIDI mapping changes between application launches. Loading Audio Unit plugin for the first time could cause an audio artifact to play. Fixed a startup timing issue where the audio engine would not connect to the UI. Fixed issue of playhead disappearing in Ableton Live through Liquid Rhythm MaxLive mode. Removed unnecessary and non-functioning devices that appeared in Windows when scanning for controllers in the Device Panel in the Settings Window. Velocity shaper button icons would sometimes get out of sync with their underlying state through MIDI mapping. Ableton Push Scripting is now available in Liquid Rhythm Standalone AND Liquid Rhythm through MaxLive within Ableton. Custom BeatSeeker maps can be created in the BeatSeeker menu. Liquid Rhythm MaxLive Clip mode: Liquid Rhythm doesn’t handle very large MIDI clips yet. Real-time MIDI recording has noticeable lag. Pressing Undo during MIDI record can cause Liquid Rhythm to crash. MIDI Scripting for some devices [QuNeo, Base] is limited to Liquid Rhythm Standalone mode. We are currently working to add support for the other modes. Thanks for adding original Launchpad support. Version 1 owner was feeling left out before.